Late last month, the CANarchy Craft Brew Collective announced the release of a variety pack that includes beers from four different breweries under the Collective’s umbrella. So four different breweries in the same box; It’s a cool concept that truly nails the “variety” aspect of a variety pack. And it’s not the first multi-brewery box we’ve seen. Back in 2014, Craft Brew Alliance put out an Explorer box with beers from Red Hook, Widmer Brothers, Kona Brewing. 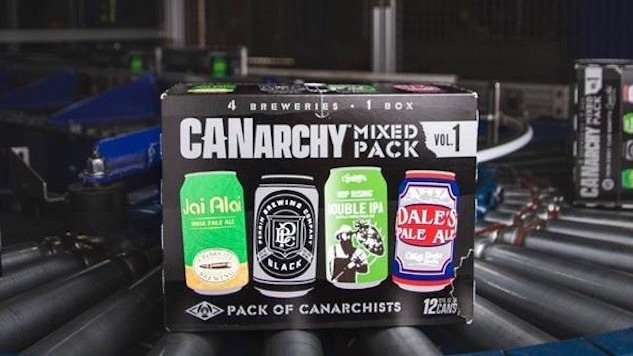 There have probably been other mixed brewery packs that have slipped under our radar, but the CANarchy box got us thinking about how much we like variety, whether that variety comes from one brewery or several. So, in that spirit, here are six variety packs that we’re excited to drink this fall. Sweetwater always has a variety pack on the shelves, but the details of that arrangement change with the season. This year, the fall version of the pack is loaded with new goodies like the Mosaic Single Hop Hazy IPA and Exodus Jamaican Coffee Porter. The latter is loaded with coffee from Javavino, which gives a slightly bitter element to the Chocolate and Caramel malts. The Mosaic IPA comes from Sweetwater’s Hatchery pilot brewhouse, and is a showcase for its titular hop strain. You also get TripleTail, a tropical IPA, and Sweetwater’s IPA, which is all about the dry hopping. This one’s available year-round, so it’s technically not a fall release, but you gotta give it up for the variety. There’s a little something for everyone: Blood Orange Wheat, Amber Ale, Citrus Maxima Pale Ale and Airstream IPA. Obviously, the Amber is the most on-the-nose choice for fall out of the bunch, but just because you’ve started putting on sweaters in the evening doesn’t mean you stop craving hops, right? Citrus Maxima is a pale loaded with grapefruit notes, as hundreds of pounds of fresh citrus peel are infused into each batch of beer. Meanwhile, Airstream IPA is a low-ABV (4.8%) unfiltered IPA with more citrus than bitterness. Psyched to put on a flannel and drink some barrel-aged beer? Boulevard has the variety pack with your name on it. The Great Eight is packed with four barrel-aged beers, two of which are year-round offerings, while the other two are limited release. Oh, and they’re releasing two different variety packs depending on where the beer is being sold. It’s like when the movie Clue was released and you got a different ending depending on what theater you went to. You could do a road trip and put both boxes together and you’ll have a hell of a lot of barrel-aged goodness. Both boxes get two bottles of Bourbon Barrel Quad (an Abbey-style quadrupel aged in bourbon barrels for three years) and Whiskey Barrel Stout (a blend of fresh beer and aged beer that comes in at 11.8% ABV). If you live in Kansas City, you’ll get a box with Cognac Cask Aged Dark Saison (full of nutmeg and leather) and Tequila Cask Aged Imperial Stout (doesn’t sound ridiculous and awesome?!). If you live in other parts of Boulevard’s distribution, you’ll get Brandy Barrel Belgian-Style Golden Ale (vanilla and peaches) and Jamaican Rum Barrel Imperial Stout (aged for a year in Jamaican rum barrels). Personally, I want them all. I have mad respect for Sam Adam’s Octoberfest, which got me through some dark times in the ‘90s while I was living in a craft beer desert. That beer will always have a special place in my liver, and Sam Adams’ new Beers of Fall pack is the perfect excuse to revisit that Octoberfest, because it’s surrounded by other intriguing seasonal offerings, namely a Spruce Lager and Coffee Pale Ale. There’s also a Pumpkin Ale and the original Sam Adams Boston Lager, but really, I’m interested in the Spruce and Coffee numbers. I dig the idea of using spruce tips in a beer because I like the idea of drinking pine trees, and the Coffee Pale, which is getting good reviews, has coffee and hops. Those just happen to be my two favorite things. Here’s the variety pack that inspired this story, because it really gives the drinker a range of craft beer experiences in a single cube of cardboard. You get Cigar City’s Jai Alai, one of the most well-regarded IPAs in the country as well as Dale’s Pale Ale, which continues to blow me away every time I drink it. Inside this box you’ll also get Black Ale from Perrin Brewing, which pours dark but drinks pretty light, and from Squatters Craft Beers, you get Hop Rising, a dry-hopped IPA out of Utah that comes in at a heady 9% ABV. The multi-brewery format is an intriguing one that I’d like to see CANarchy explore more in the future. And based on the Volume 1 tag in the corner of the box, I’d say we’ll see more of these mash-up boxes in the future. Schlafly released an excellent Hop Trial mix pack during the summer that’s full of beers that feature hops from the Pacific Northwest. I never got to check it out, but I’m psyched to get my hands on their fall variety pack, the Bonfire Box, which is about as balanced as a variety pack can get with Schlafly’s Pumpkin Stout, House Brown, Dry Hopped APA, and Pilsner. It’s a slate of beers that’s curated for that first backyard fire. I only want a couple of pumpkin beers a year, so getting them sandwiched by these other goodies is a smart way to go. The Dry Hopped APA is comprised entirely of American-grown hops and malts, while the Pilsner is all German, with Magnum and Tettnang hops. The House Brown might be the most “fall” of them all, with a body that’s full of rich, assertive maltiness. I’m getting excited just to think about it. Where’s my scarf?